The Chevrolet S-10 was fiirst introduced to the market in the early 1980s. The second generation arried in 1994 before the vehicle was finally retired in 2004, at which time it was replaced by the Chevrolet Colorado. The second generation is the longest running and covers most of the used Chevrolet S-10s that you'll see on the road today. At the time that this vehicle came out, Japanese light trucks dominated the market. The Chevrolet S-10 was well designed and interest was strong right from the start. It was priced low enough to make it affordable for everyone and came with enough different configurations that there was one to suit even the most discerning consumer. It didn’t have the payload or the same towing capacity as the bigger trucks, but not everyone needed those same capabilities. Chevrolet started the truck with a standard cab size then added the extended and crew cab later in the vehicle's lifecycle. The truck could be configured with short or long beds. In 1996, the extended cab model received a third-door access panel for easier loading and unloading to the back seat. There was a fold-down jump seat to hold an extra passenger if required - preferably a small adult or child as the room was limited. This was around the same time as the arrival of the Sportside bed. In 1995, the optional ZR2 package and SS package arrived. 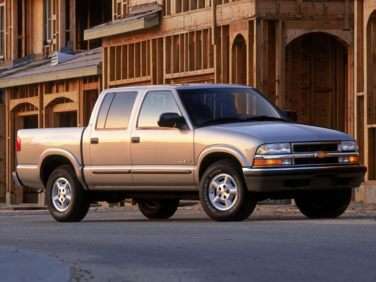 The ZR2 was an option fo rthe regular-cab short-bed models and the extended cab after 1995. Under the hood of the 1994 S-10 rear wheel drive models is a 2.2 L four cylinder engine that produced 118 hp. There was also an 4.3 L V6 that produced 165 hp engine that was standard for the 4WD and was an option for the 2WD models. By 1996, both the horsepower and torque were increased pushing the horsepower up to 195 hp. There were two transmissions available; a five-speed manual and a four speed automatic. Other changes over the years happened in 1998 when the vehicle was given a light overhaul. Chevrolet updated the exterior, the interior, the brakes and the 2.2 L engine. By the next year, Auto-Trac AWD had been added as another option. Also around the same time, the SS package was dropped and the ‘Xtreme’ sports model package was the 'next' new thing. The only other model change happened in 2001, with the arrival of a Crew Cab model offering seating for five occupants and four-wheel drive with an automatic transmission. Standard features on the later model Chevrolet S-10 include a compass, cruise control, air conditioning, bucket driver and passenger seat six speaker(s), leather covered multi-function steering wheel with tilt adjustment, tachometer, ventilation system, Front seat back storage, Low fuel level warning, remote power locks, power steering and a full complement of power accessories. ***** The base 2WD Chevrolet S-10 models had 15-inch wheels with directional vents. The special packages came with 16 inch wheels. The 4WD models came with 15-inch tires. The earlier models of this light truck did not focus on safety issues. Standard on all models were rear antilock brakes. Standard on the V6 engine models are ABS brakes - an option on the four cylinder models. The ABS became standard in all 1996 models forward. Driver airbags came out in 1995 but it wasn’t until 1998 that the passengers received the same consideration. Other safety features standard on the later model S-10s are an energy management feature, daytime running lights, anti theft protection, rear seat head restraint, airbag switch for for turning it on and off, as well as adjustable upper belt. In the government crash tests, the Chevrolet S-10 did not fare well. As an example, the 2003 Chevrolet S-10 only received a two star rating for the driver and a three star rating for the front passenger in the frontal impact tests. For the side impact tests, the front occupant received a three star rating. The rollover resistance test showed an equally uninspiring result at three stars. The Chevrolet S-10 was discontinued and replaced by the Colorado.